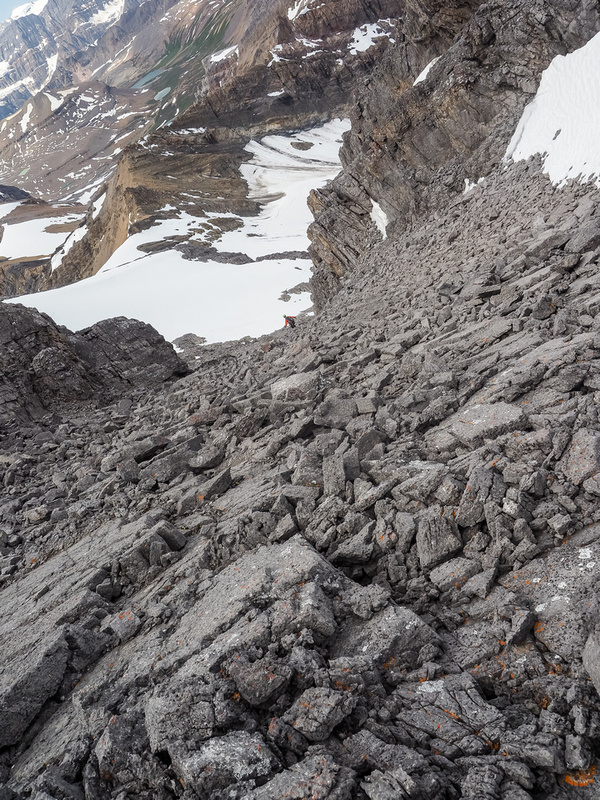 Difficulty Notes: Minor glacier crossing with moderate (exposed) scrambling along the ridge. On Wed or Thu the usual flurry of emails went out regarding plans for the weekend. When the dust settled, Phil Richards and I were left choosing between two lengthy day trips. In the end, Watermelon Peak won out. Most people do Watermelon as part of an overnight bivy at Lake Alice, and while this is a wonderful way to experience this peak and this lovely area, we simply didn’t have the schedule to allow it this time. It was while we were poking around at the route and planning the trip that Phil wryly texted me – “you realize that Bobac is also in the area“. Jeez Phil! I’m over 40 you know! Ah well. He knew, and I knew, that I was in, the moment he texted the option. We were apparently going to day trip both Watermelon Peak and Bobac Mountain. I agree 100% with Liam when he states that it’s important to break free of the lightweight, hustle bustle, go-as-fast-as-you-can mentality of our modern culture. That’s what backpacking with my daughter next week is all about. That is not, however what this trip was going to be about. 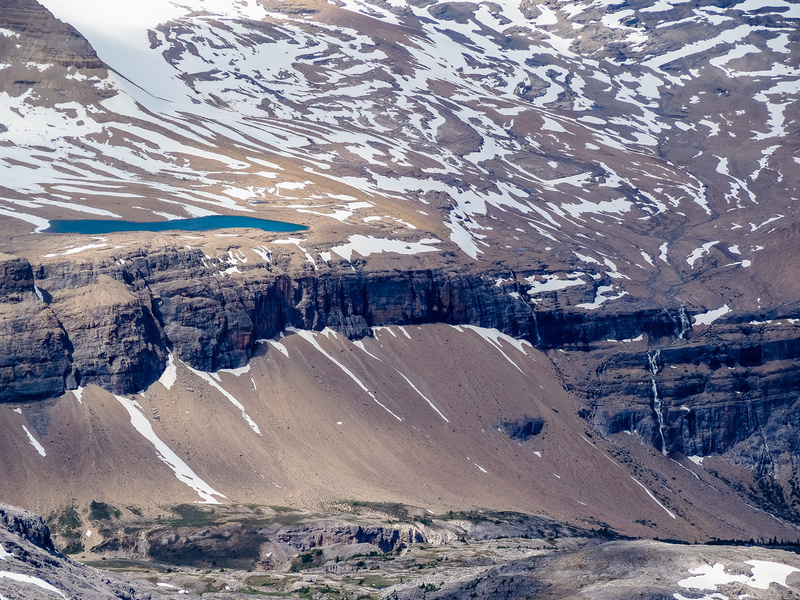 This trip was all about going as light and efficient as possible, while passing through some of the most gorgeous scenery that Banff National Park has to offer. I was a bit concerned about tstorms cropping up mid-day so we made sure to plan for Watermelon and count on Bobac only as a bonus peak. It was supposed to be very hot, which made this objective even more perfect – there’s running streams almost the whole way along the approach so we could carry minimal (i.e. no) water on approach and save weight while still staying hydrated. 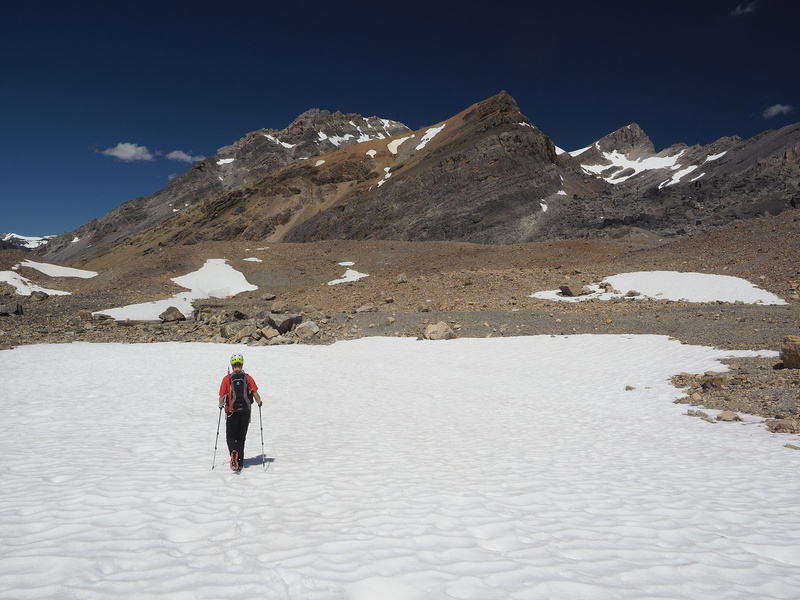 We also decided to wear approach shoes rather than boots, but did opt to carry axes and crampons for the glacier on Watermelon. With the day planned, it was only a matter of execution. 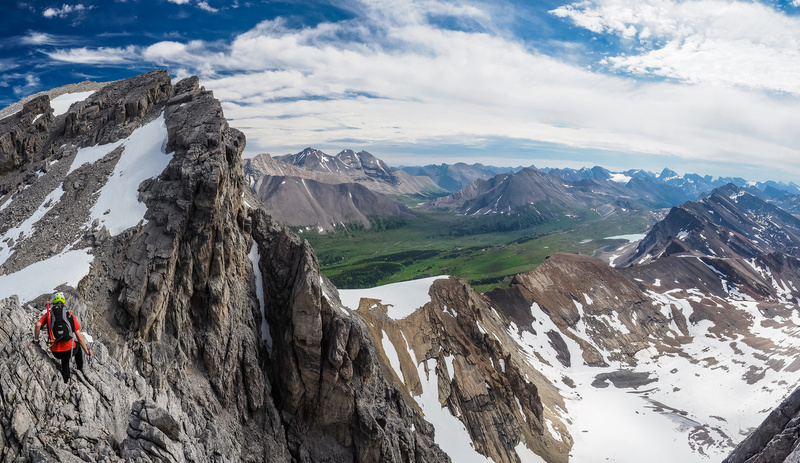 I went to bed on Friday night filled with anticipation and excitement – I’ve hiked this area before and these peaks have both been on my list for many years now. I knew that if the weather cooperated we were in for a pretty special day. I was out of my front door at 03:15 and after picking up a precious cup of Tim’s I was barreling my way to Phil’s house in Canmore. We were thankful that there was no smoke in the air from the many burning wildfires in BC as we drove the scenic hwy 93 towards Jasper from Lake Louise. We were also relieved that the Helen Creek trail wasn’t closed, as it usually gets cordoned off around this time of the year, thanks to a resident Grizzly. (Note: This is not the Helen Lake trail which is slightly longer, much more official and starts a bit further up hwy #93.) As we started up the Helen Creek trail, we were assaulted rudely by several hundred mosquitoes. These little buggers are out in full force this year! Speaking of rude assaults – I had forgotten two things about the Helen Creek trail. First of all it’s bloody STEEP from the parking area! No way anyone’s pushing a baby stroller up this sucker. 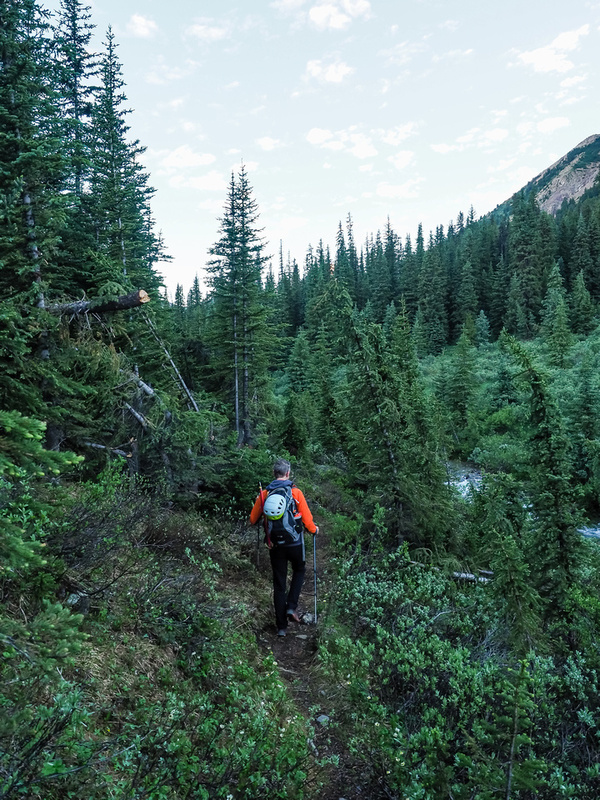 Secondly, it’s not an official trail – it’s more of a route that happens to have the so-called “Kane Effect” on the initial section to the Dolomite Peak ascent slopes. 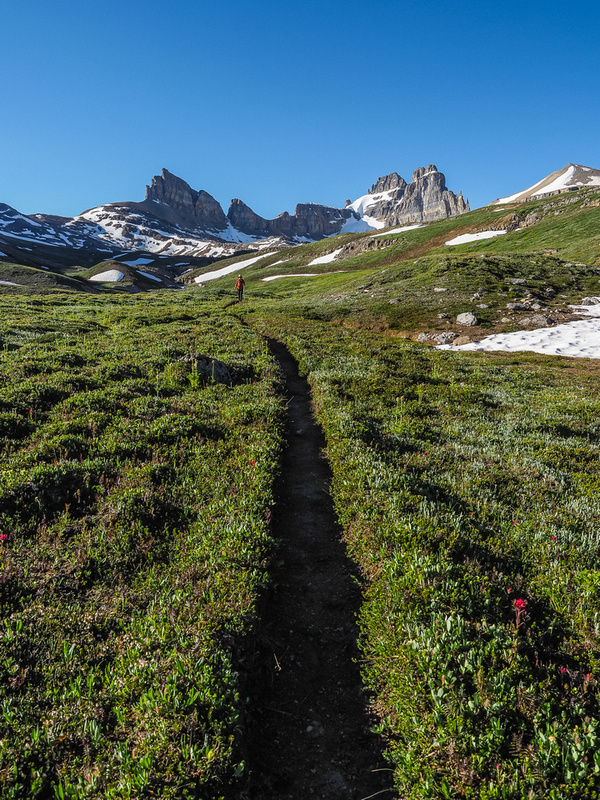 From the base of Dolomite Peak, it’s a combination of trail, route and bushwhacking. I’d forgotten all about this part. We even had to take our shoes off to wade across Helen Creek – something I don’t recall doing last time I was in the area. Eventually we kind of gave up on a defined trail and followed the terrain and our noses up along the Helen Creek drainage until we ended up cutting over Helen Ridge at the perfect spot (lucky!) and started our descent towards the lovely, calm waters of Lake Katherine below. The lovely environs of Lake Katherine with Cirque Peak at far right. We satisfied our thirst near the lake and after completing our second water crossing of the day at its inlet, continued our march down (yes, we had to lose ~200 vertical meters down from Helen Ridge) the charming Dolomite Creek trail. The morning couldn’t have been more satisfying. The heat hadn’t hit yet and there was absolutely no wind. The views of OXO and Dolomite were stunning, as were the views towards Conical, Quill and of course, Bobac and Watermelon. 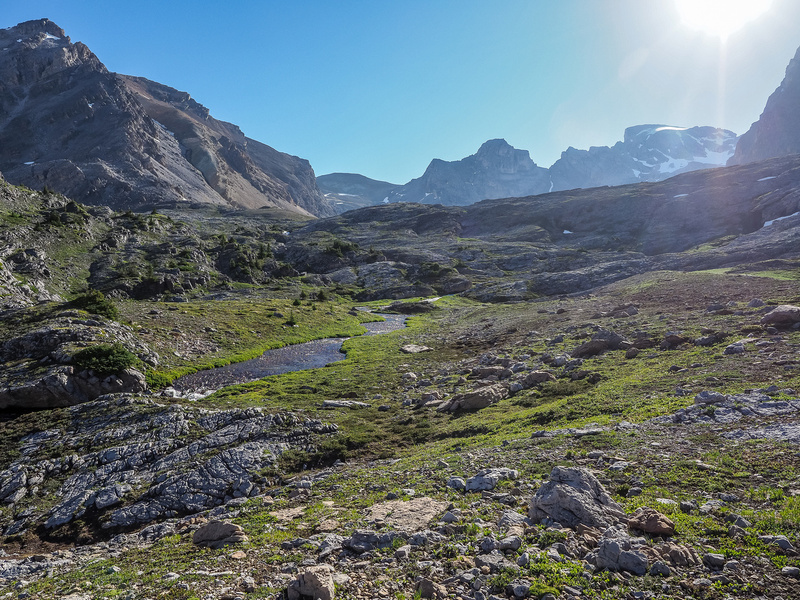 Cirque, as always, showed off it’s curves while a huge number of Marmots frolicked in the picture-perfect alpine meadows all around us. This part of the park is sublime, to say the least. 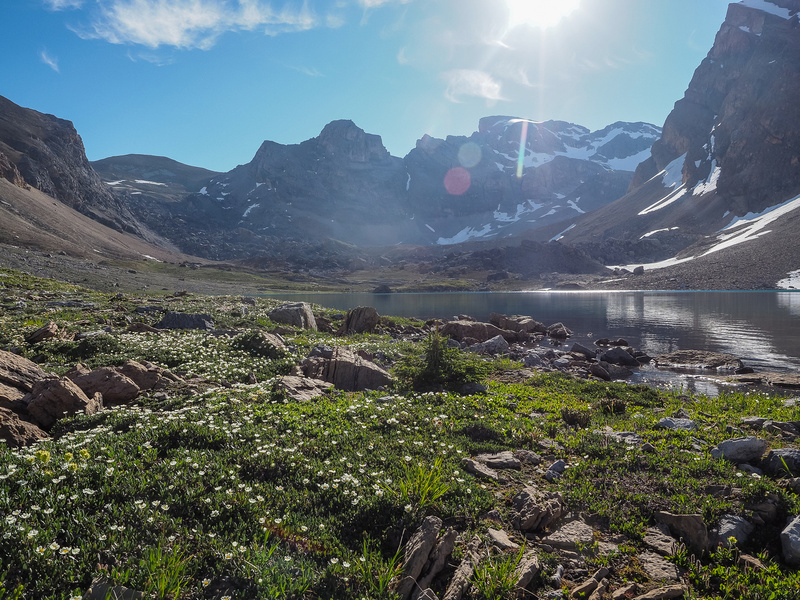 Most of the hordes of hikers who huff and puff their way to Helen Lake have no idea that they’re only 1-2km away from this peaceful piece of backcountry paradise that hides out of sight behind Helen Ridge. This was Phil’s first time in the area and he was suitably impressed. 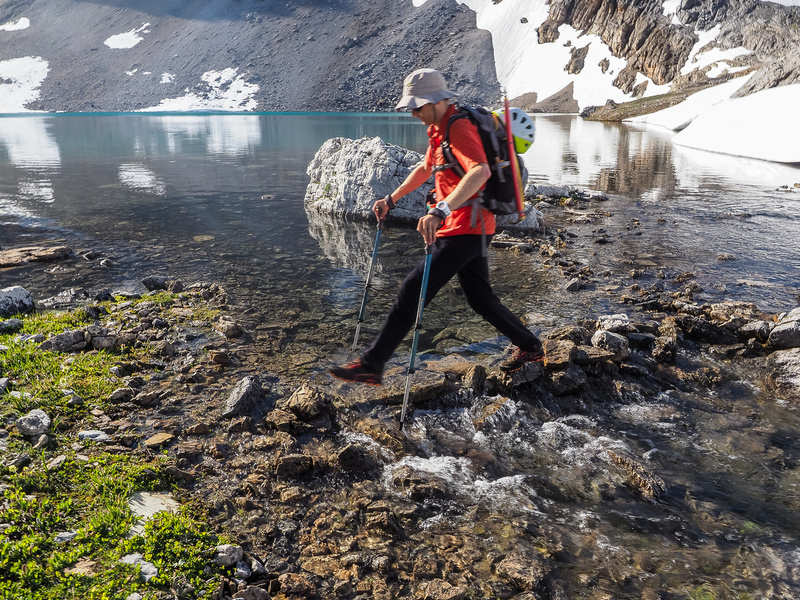 Eventually we lost all the height we needed to and took off the shoes one last time to wade a fairly fast and full-flowing Dolomite Creek in order to gain off-trail access to Lake Alice. If we thought the scenery and hiking was great along Dolomite Creek, we were blown away by the approach from the valley up to Lake Alice. 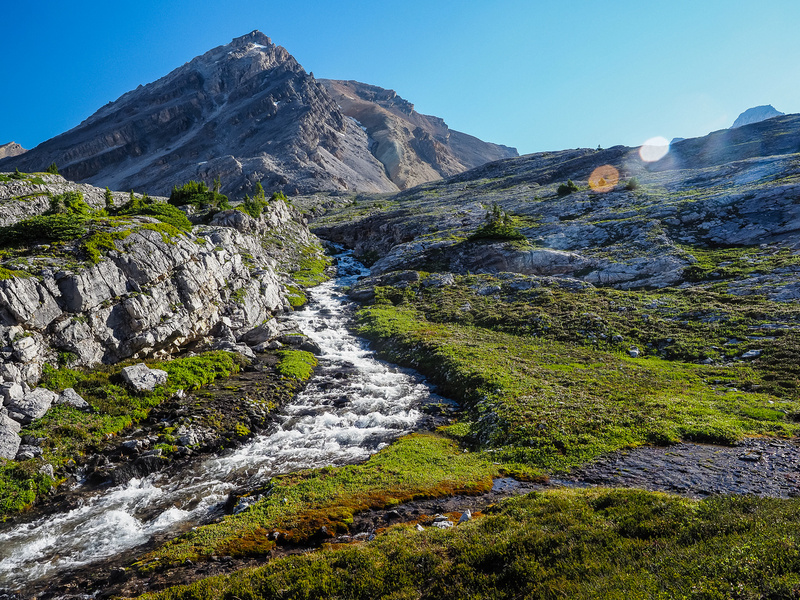 The outlet stream from the lake down to Dolomite Creek rushes down a mixture of alpine meadows, karst pavement and rocky ledges before disappearing into the ground and draining back out of the rocks near valley bottom. Millions of wildflowers littered the landscape at our feet and filled the air all around us with their intoxicating aromas. By the time we got to Lake Alice (3.5 hours from the truck) we were already overloading on sensory input and we hadn’t even started climbing any peak(s) yet. This was indeed shaping up to be one of those days you dream of experiencing in the Rockies but only happens occasionally when a lot of factors line up perfectly. Phil takes in the wild scenery below Lake Alice. The outflow stream from Lake Alice is in a good mood this warm, summer morning. We passed around the lake on it’s western shore and were soon in the giant boulder field that’s clearly visible from space on Google Images. We were worried that traversing this field would take a lot of time and energy but the boulders were so big (think tiny house or full size van) that we simply walked in between them. The landscape here is a photographer’s dream and it was tough to move through it quickly. 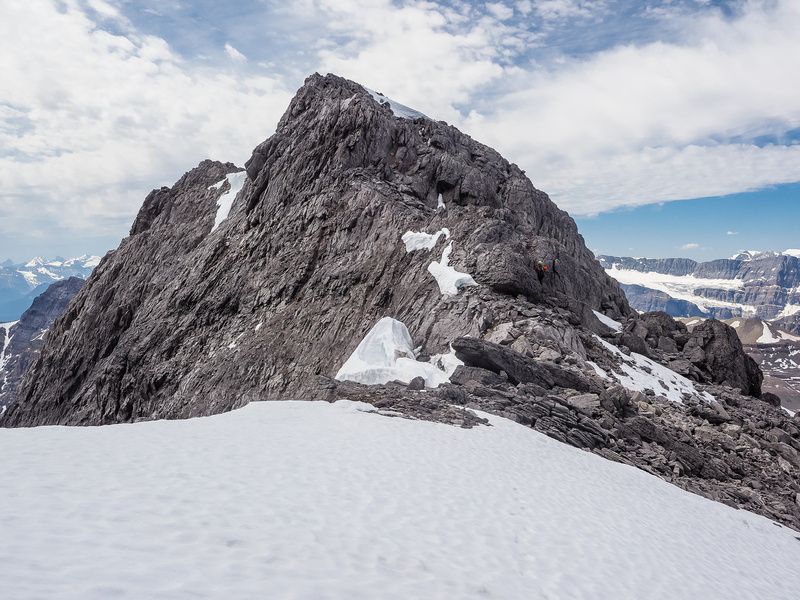 As we stared up at the small glacier and snow slopes leading steeply to the summit ridge above, we wondered if wearing light approach shoes might interfere with a safe ascent. 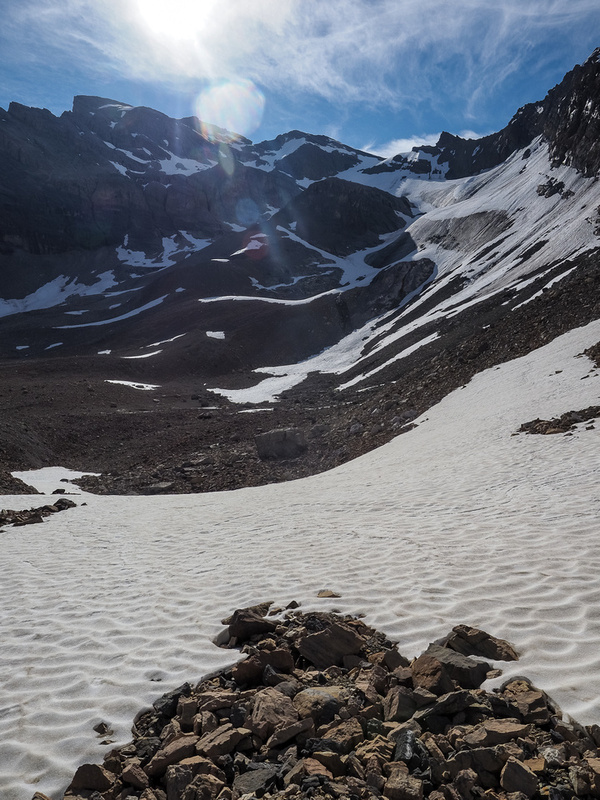 We ascended the lower snow slope towards running water and filled our water bottles for the first time – worried that we might run out of water sources higher up. 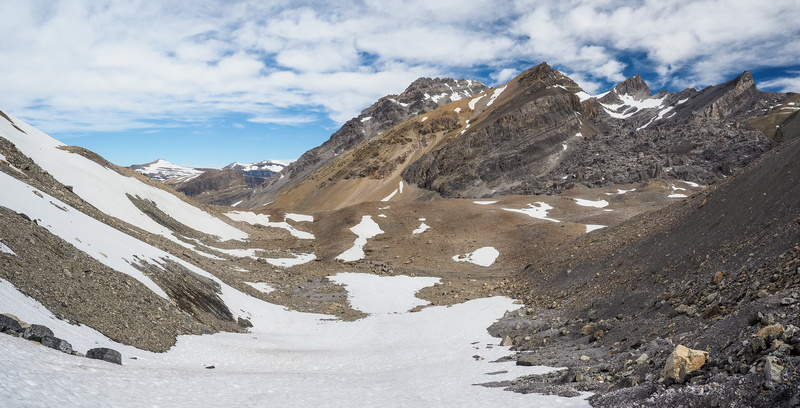 We decided to ascend a steep snow slope on the edge of the glacier rather than deal with scree from this point. I was wondering how my light crampons would work with my approach shoes and was relieved to discover they worked perfectly. On the soft snow they added a lot of assistance, on very hard snow or ice they wouldn’t work very well due to the flexibility of my approach shoes. 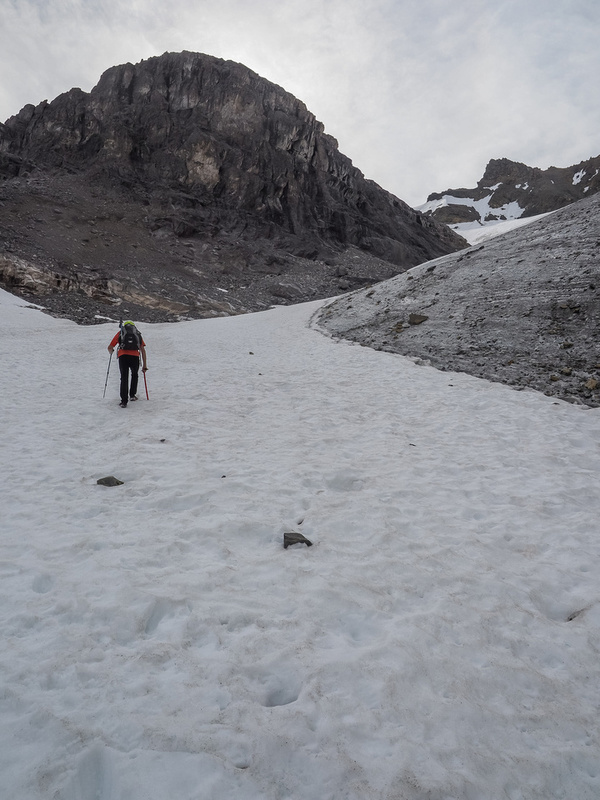 We made very good time up the snow / glacier and were soon grunting our way up the final slope which was less steep than it appeared from Lake Alice. I was a bit nervous about the clouds that were building from the SW, but we were glad for the cool air and lack of sunshine on the snow / glacier ascent. 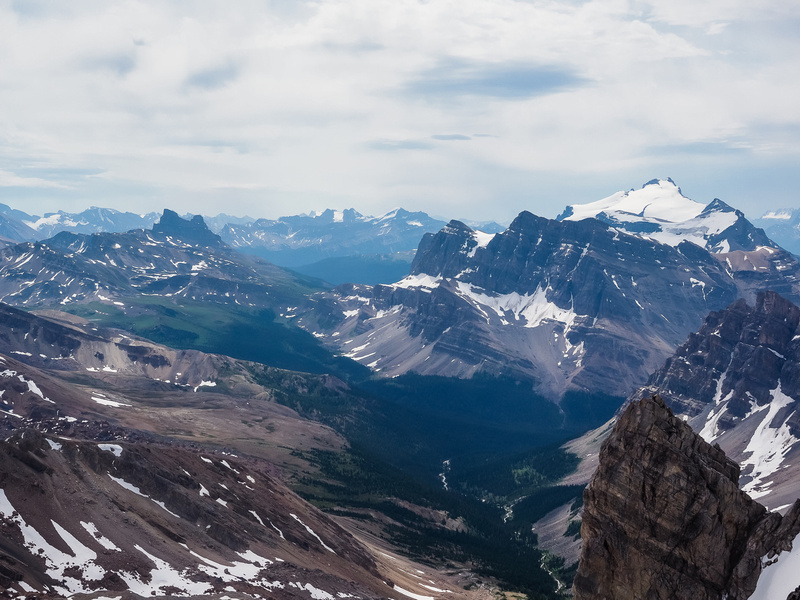 Our views to the north and northwest were already mind-blowing as we finally made the ridge and took in the incredible scenery of the Siffleur River Valley and the Mosquito Creek area including Hector and Molar Mountain. 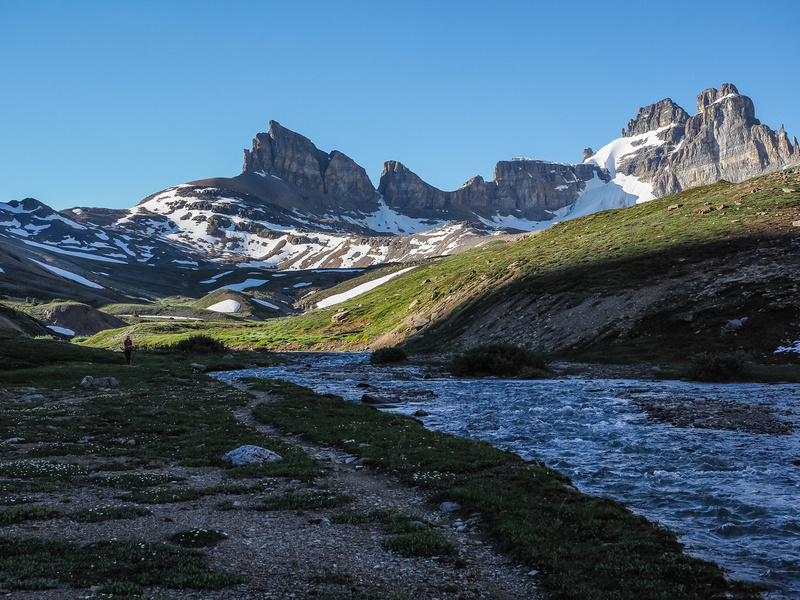 July is a great time of the year to take in these views as the deep valley greens contrast with the grey of the Rockies, the white of the glaciers and snow fields and the deep blue of the summer skies. We were happy to note that we happened to be in between two systems, light cloud to the SW but clear skies in every other direction. 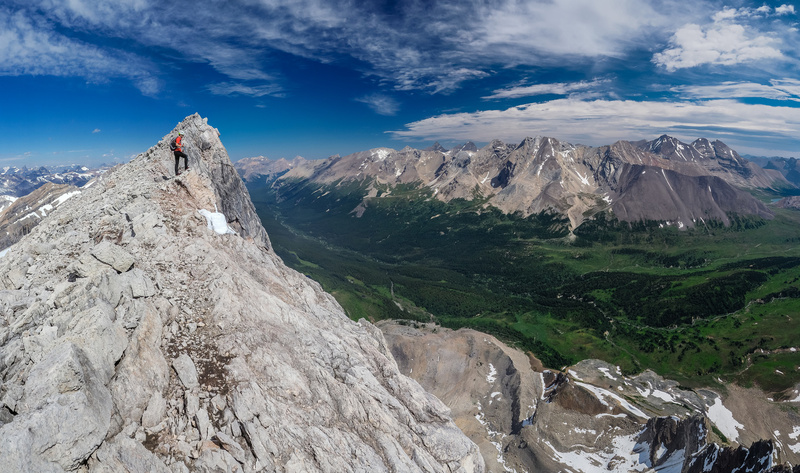 As we started the ridge traverse to the summit block we slowed down a bit and enjoyed the incredible scenes. 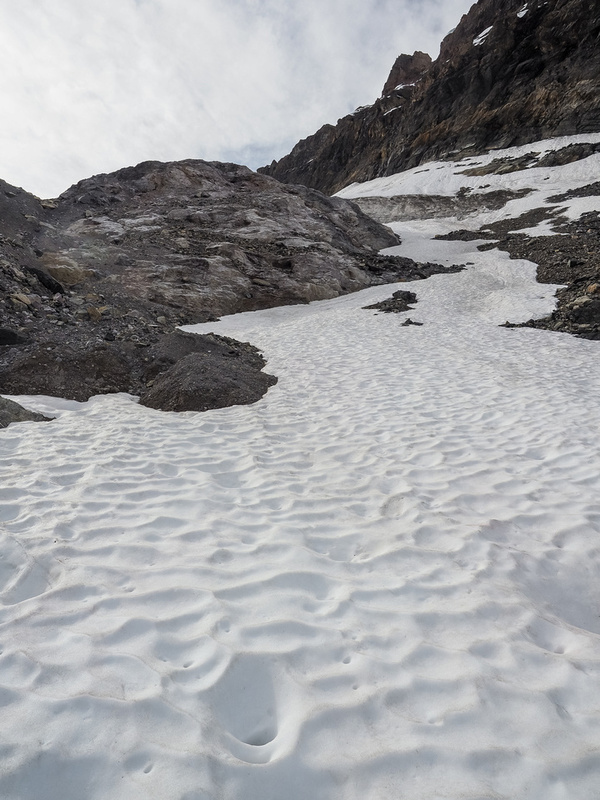 After cutting across the upper glacier, we will now trend back to our right via an obvious snow ramp leading up to the ridge. 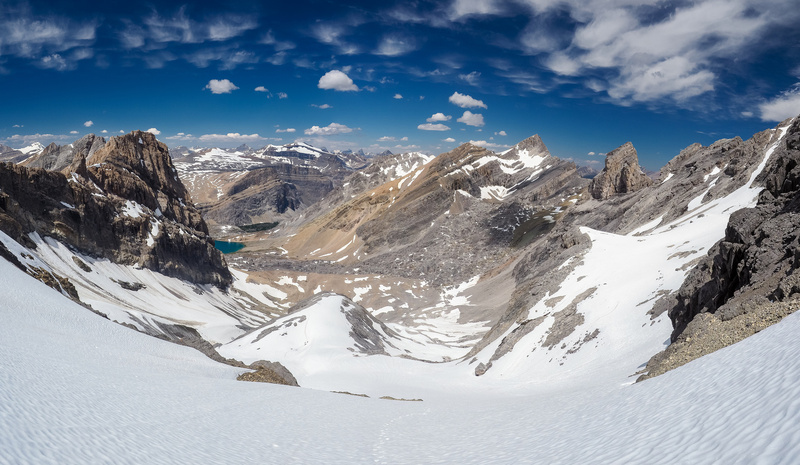 Mind-altering views as we gain the ridge. This is looking back to the west with Hector at far left and Lake Alice at lower right. 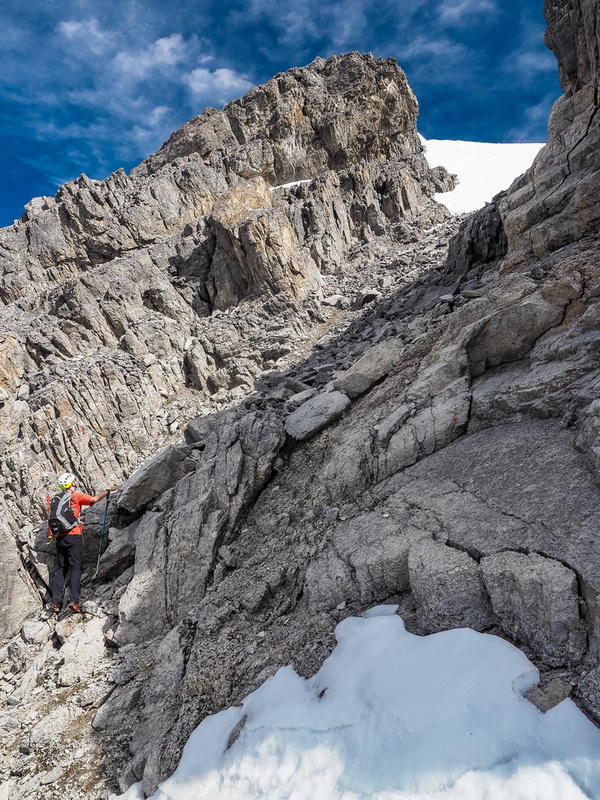 We knew from several reports that the ridge to the summit block is the technical crux on Watermelon Peak at moderate scrambling. As we made our way along the ridge the scenes just kept one-upping each other, getting better and better as we traversed. The traverse wasn’t long but there were a few sections that made us hunt around for the best lines. If on route the scrambling shouldn’t exceed moderate. Some folks might be a bit intimated by the exposure but if you’ve made it up the glacier and snow slopes you should be fine here. 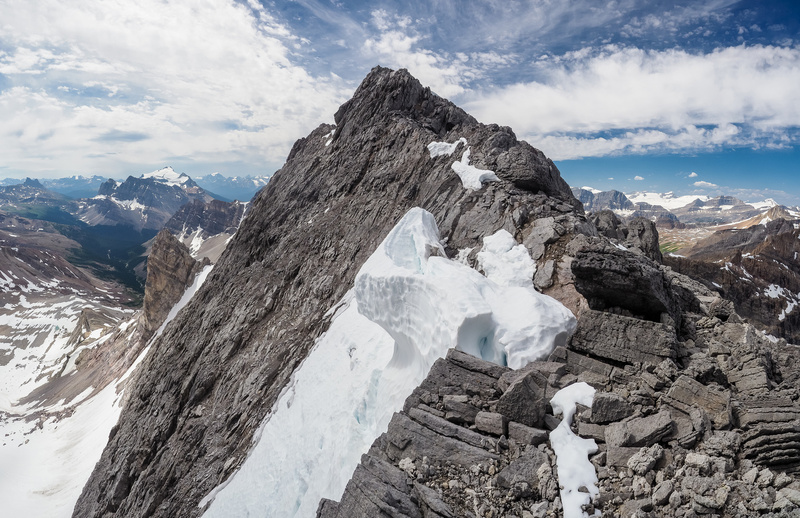 As we descended to the col before the summit block we were treated to some incredible exposure down the east face of Watermelon down to a pocket glacier which eventually drains into Mosquito Creek. The views over Quartzite Col and over to the Willingdon and Devon Lakes were very, very acceptable. 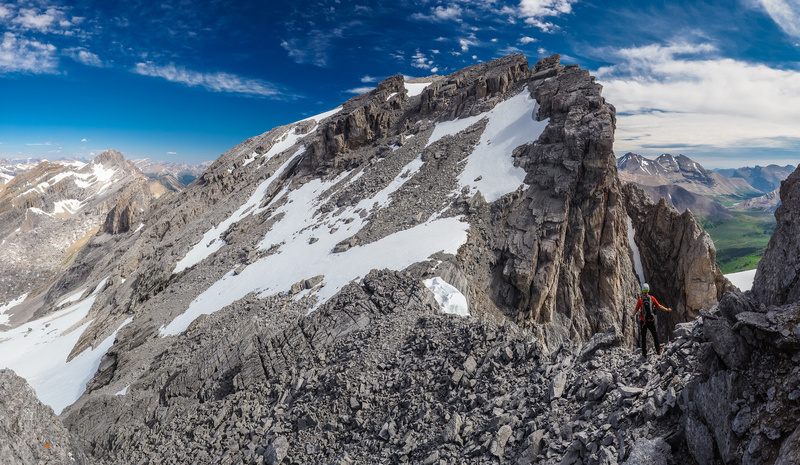 The final grunt to the summit was nothing more than a small boulder / scree grind and before long we were enjoying the wonderful views off of our first peak of the day. 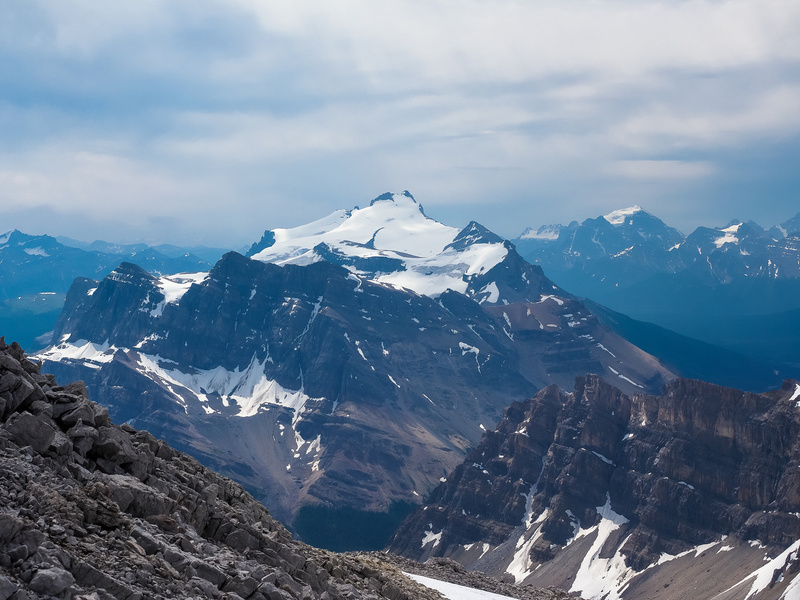 It had taken us 5.5 hours to the summit – much quicker than expected, not that we were trying to set a record or anything. We both commented on how great we felt – despite going quickly we felt overwhelmed by the gorgeous natural scenes exploding on our retinas at every turn. Getting onto the exciting ridge before the summit of Watermelon (L), looking out over Quartzite Col towards the Devon Lakes group at center left. Phil at the final col before the summit block. The summit slopes are accessed easily via the gap through the cliffs, located just right of center. Phil takes in the views of the summit ridge down across the Siffleur River Valley below. 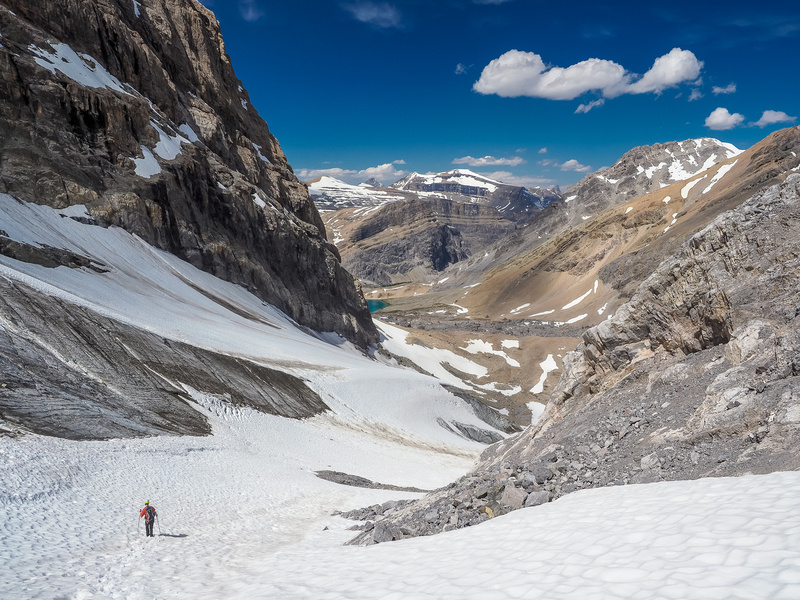 The views over the entire Siffleur River Valley are stunning and unique from both Watermelon and Bobac – both of which are situated to give a birds-eye view of a huge portion of this backcountry vista. 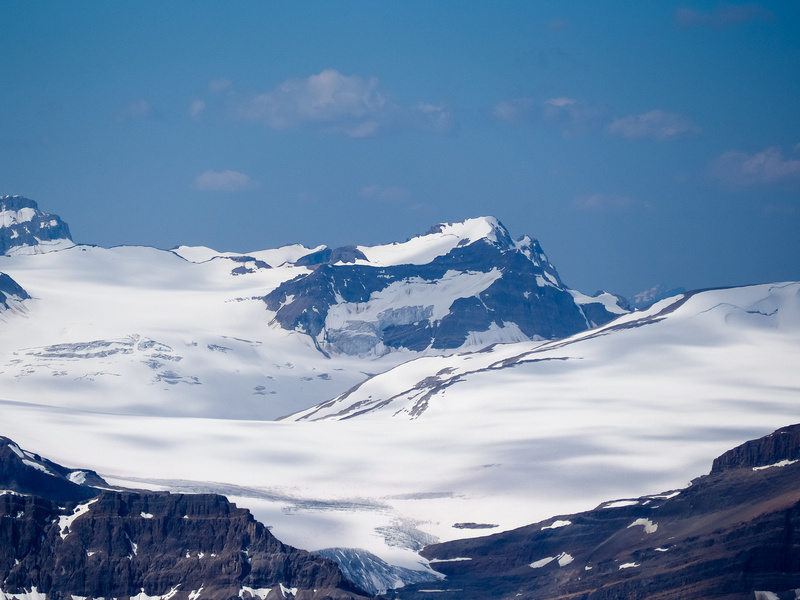 Views over Oxo towards the Wapta Icefield. I have very fond memories of my trip into the Devon Lakes area in 2013 with Eric, Ben and Steven. 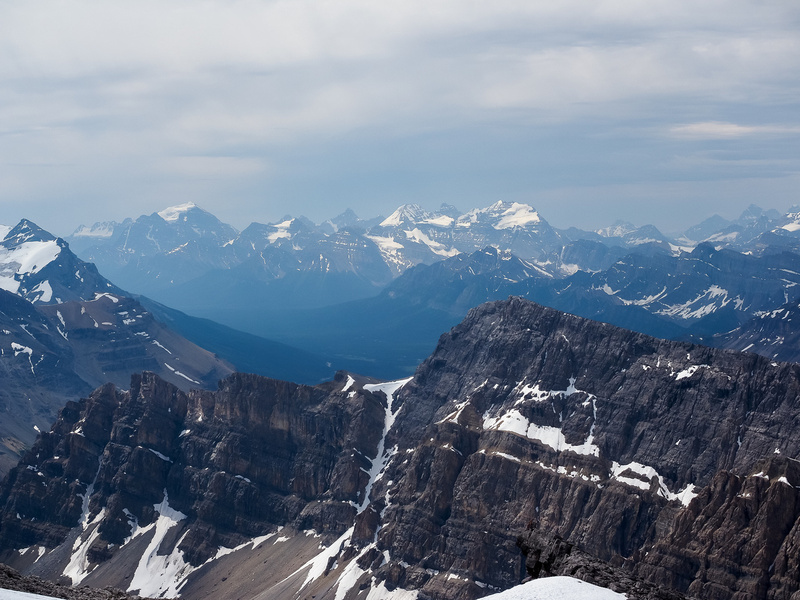 We traversed the Siffleur River Valley from right to left and climbed Devon Mountain, Willingdon, Crown and South Tower. 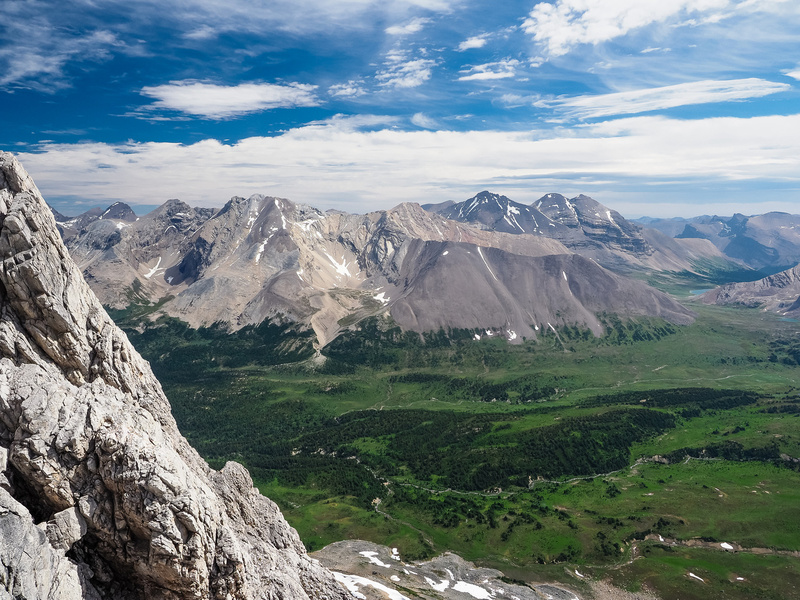 Many people don’t realize that a key advantage to day-tripping remote peaks is that you get to enjoy a smorgasbord of natural phenomena that takes most folks a much longer trip and a much heavier pack to experience. It’s like having a really, really good meal, but in several mind-altering bites instead of several hours. Even though the longer meal is usually the preferred way to enjoy a palette explosion, imagine all the same flavor and experience of a lengthy meal compressed into just a few heavenly bites! That’s a pretty cool experience and Phil and I have done it before, so we knew what we wanted out of this day and were lucky enough to be getting it. Given the clear skies overhead and the complete lack of wind, other than a few gusts, we both knew at this point that Bobac Mountain was next. After a summit snack and some photos (!!) we started heading back down. The descent went off without a hitch and was great fun. 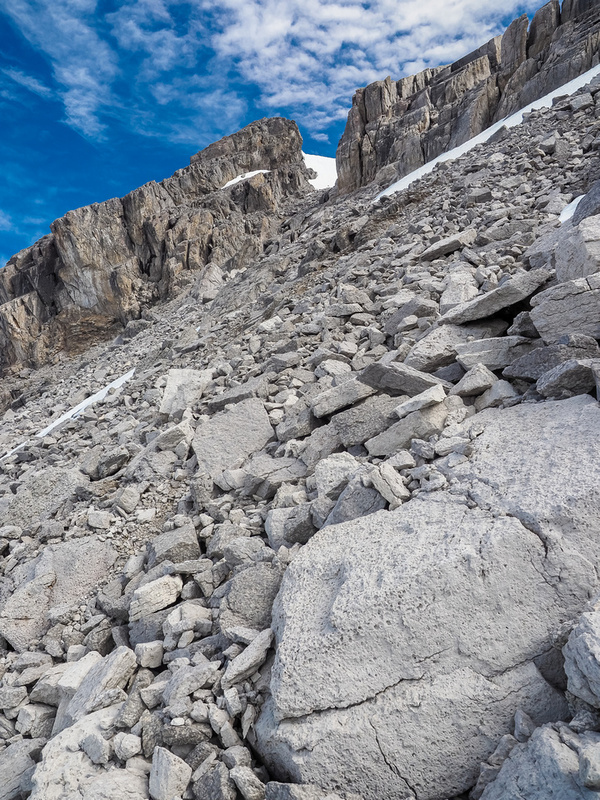 The scrambling on the ridge provided us with great views and the snow and glacier made for a very quick and pleasant descent to the giant boulder field below. 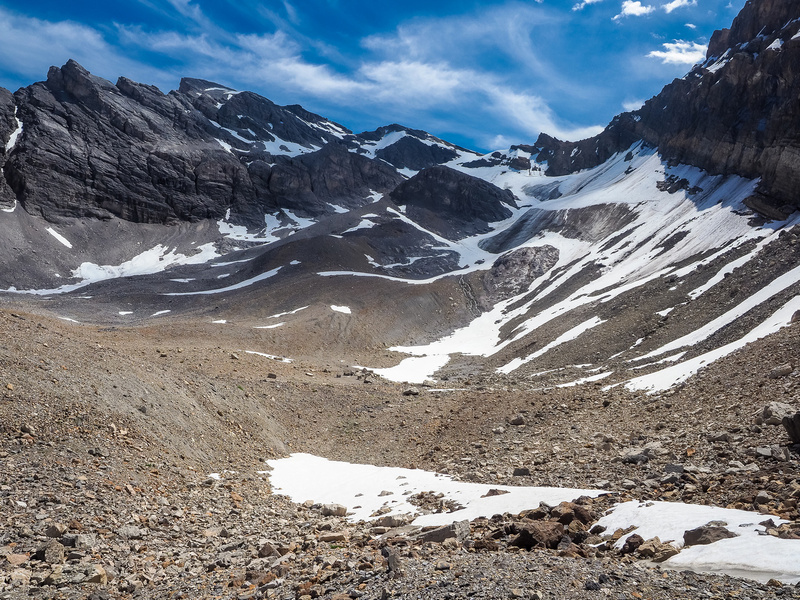 It was bloody hot when we reached the valley and boulder field between Watermelon Peak and Bobac Mountain, but our energy levels were still high enough to tackle a second objective for the day. Phil heads down the Helen Creek trail to our first water crossing of the day - across Helen Creek. Great views already looking south off Helen Ridge. 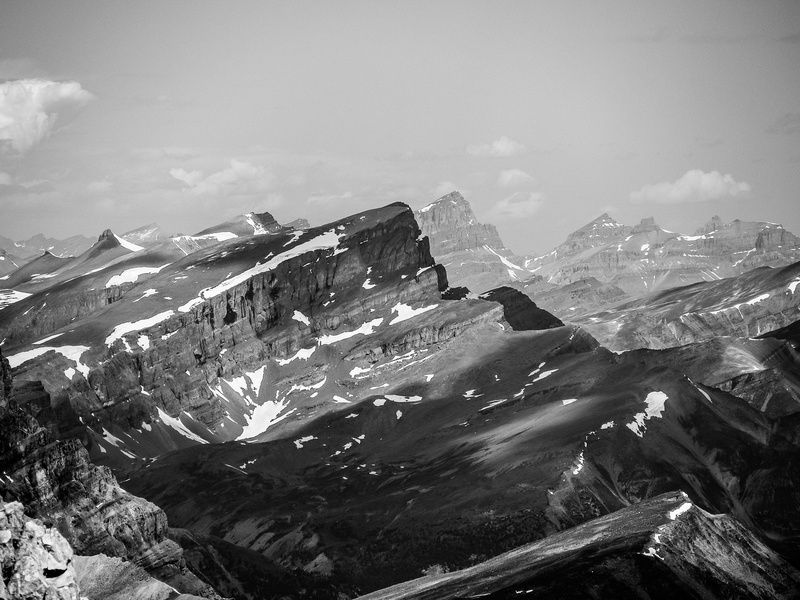 Dolomite at left with Hector, Bow Peak and Crowfoot to the right. A small tarn just past Lake Katherine. The Dolomite Trail is a beauty. Looking back towards Dolomite as we continue our descent. Done with losing height along Dolomite Creek, looking back at Phil with Dolomite in the distance. The sun makes it hard to spot but Watermelon Peak rises in the distance at right, Bobac at left. Carpets of wildflowers around Lake Alice with the blazing sun rising directly over our objective in the distance. Crossing the outflow from Lake Alice. The huge boulder field between Bobac and Watermelon with Bobac's lower flank at left. Looking up our next few hours on Watermelon Peak. 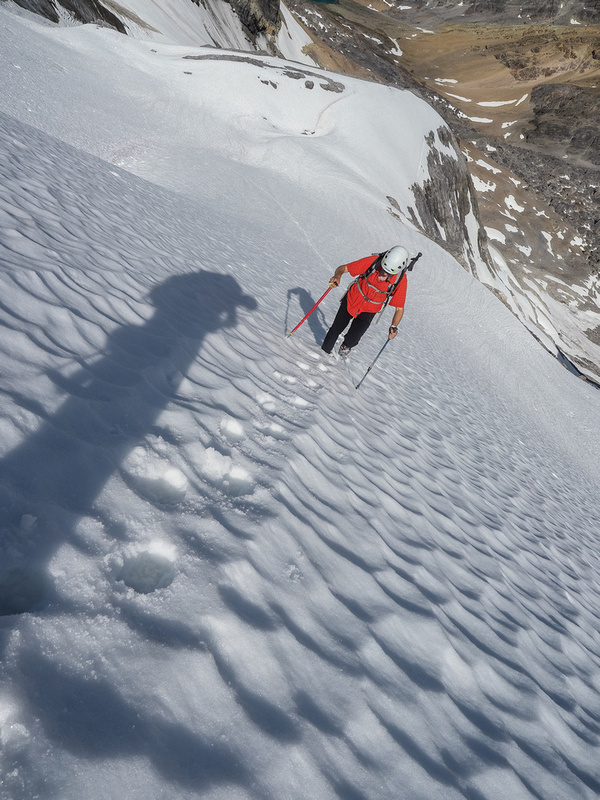 We're really hoping our decision to use light footwear won't bite us on the glacier and snow ahead. Looking back as we start up Watermelon, at our next objective for the day - Bobac Mountain. This slope was the steepest and our footwear proved capable right away. 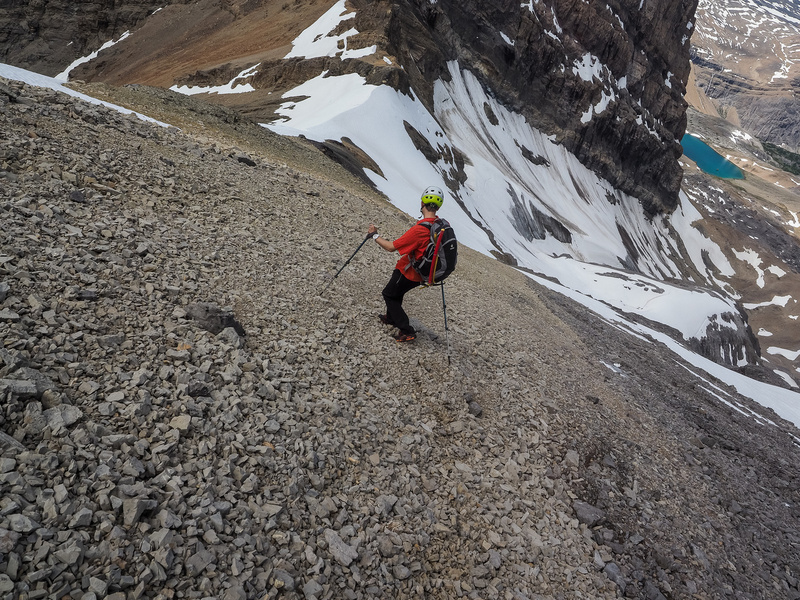 My aluminum crampons worked perfectly with my approach shoes on this mellow terrain. 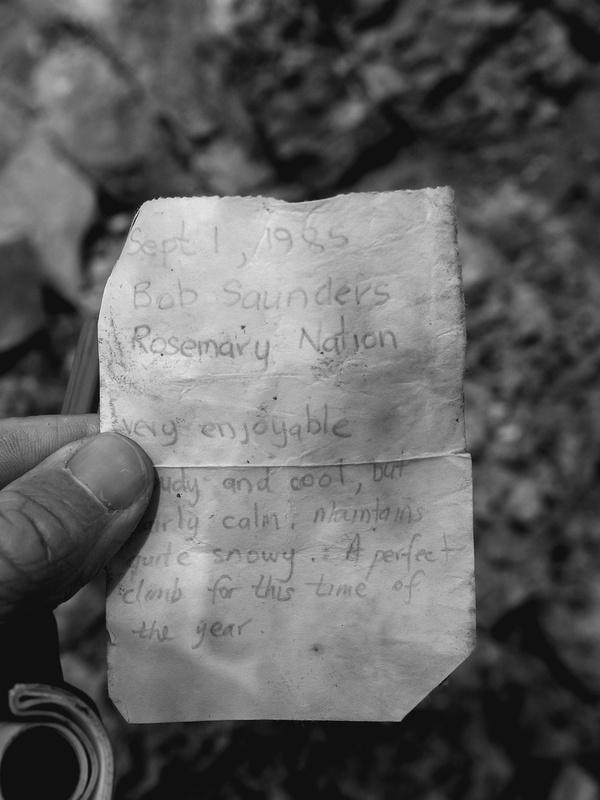 Clearly beside, or just on a small glacier as we continue to ascend. In case you think Phil did ALL the step-kicking. He did do most of it though. There is some moderate scrambling between here and the col to the summit block. Just a wee bit of exposure down the east face of Watermelon - but the holds are solid compared with some others in the area. Easy scrambling through the gap. 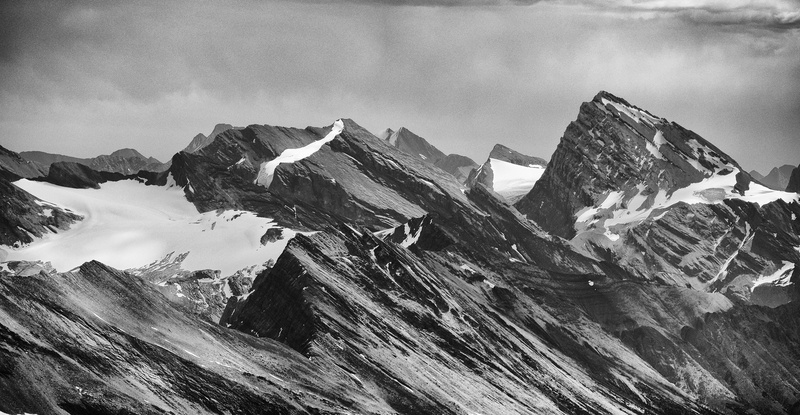 Looking towards the Willingdon peaks. 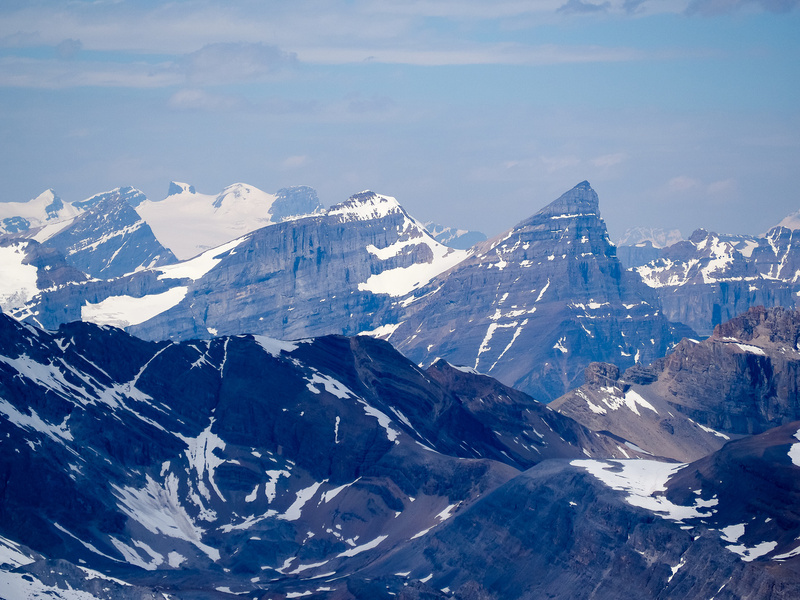 From L to R, familiar peaks looking south and west include Andromache, Hector, Balfour, Crowfoot, Gordon, Collie, Portal, Thompson, Cirque, Baker, Mummery and many others. 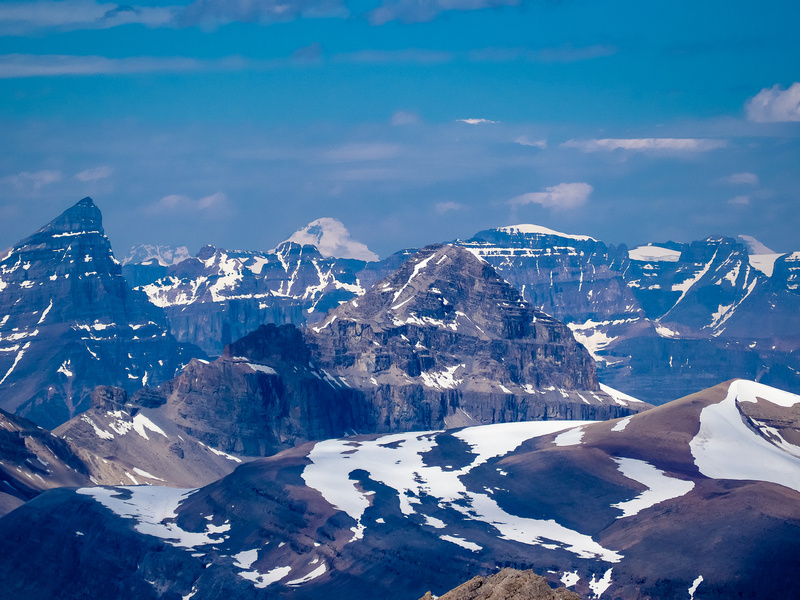 Looking towards Lake Louise with Mount Temple, Lefroy, Hungabee and Victoria visible through the atmospheric haze and the smoke from BC forest fires. 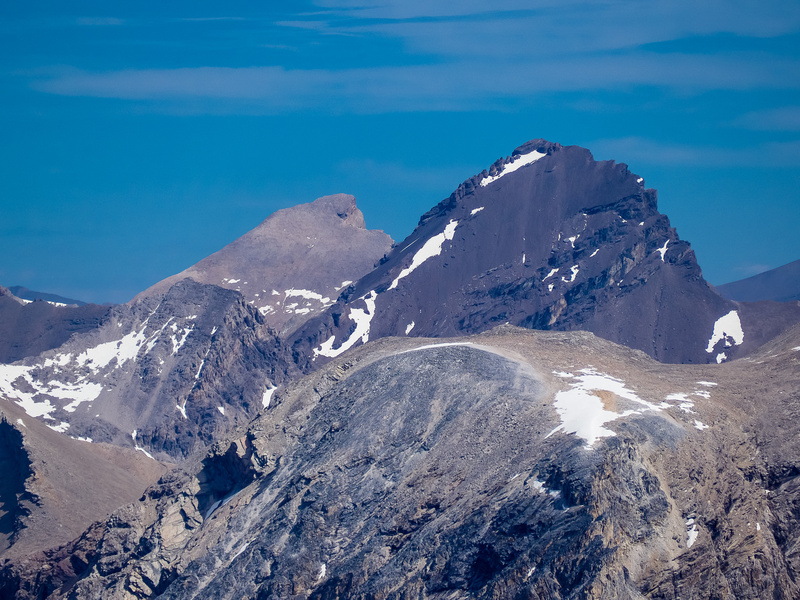 Mount Hector rises above Andromache and Little Hector with Mount Temple in the background at right. 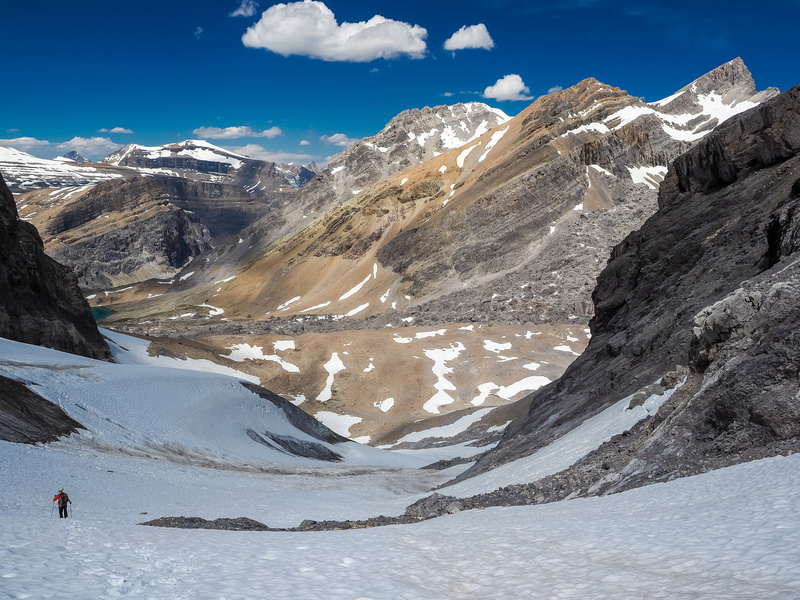 Tele-pano to the west covers many different icefields including (L to R), Wapta, Mummery, Freshfields, Lyells and even the Columbia Icefield at far right. 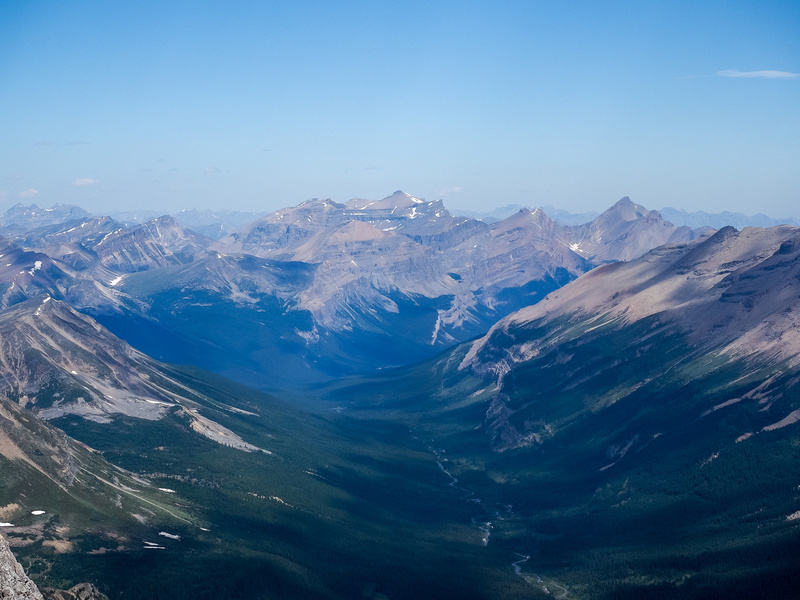 Loudon and Siffleur Mountains loom over the head of the Siffleur River Valley to the north. 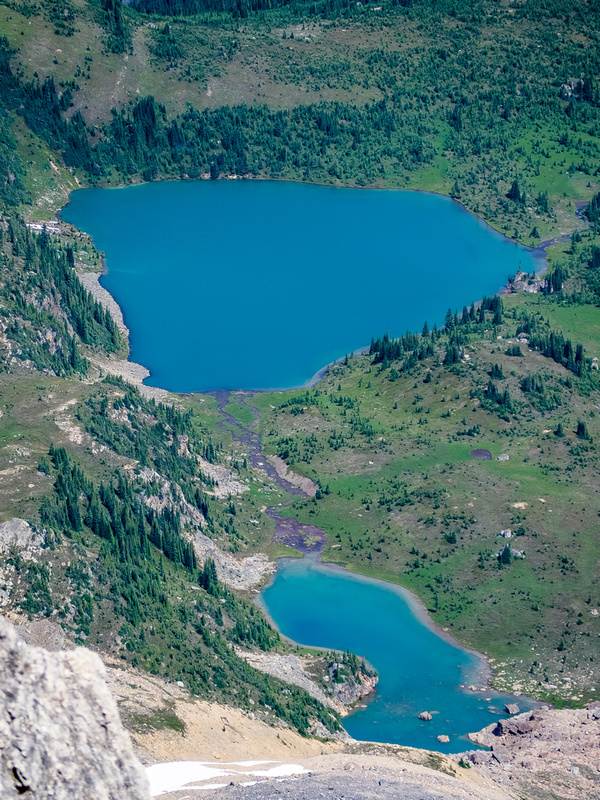 These are just two of the many colorful tarns and ponds that line the Siffleur River Valley. The lovely Mount Baker rises impassively over Cirque Peak. 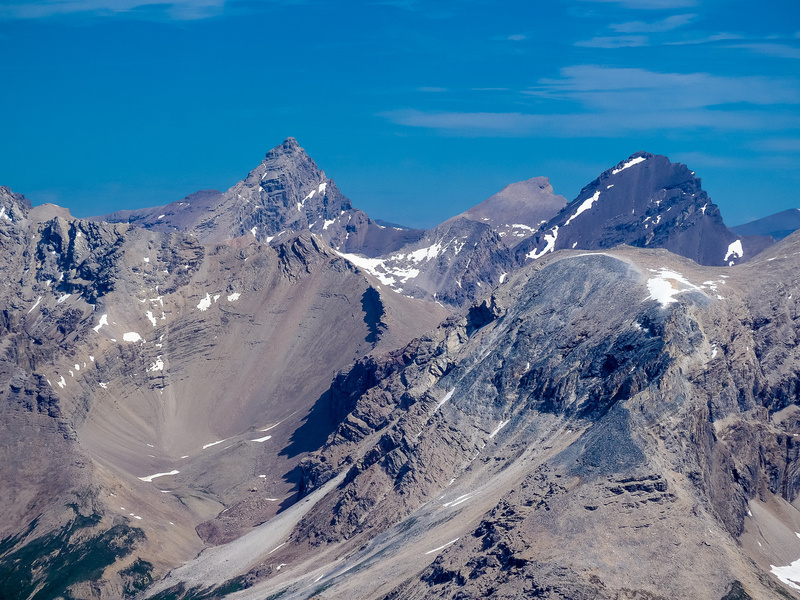 To the north lie Marmota, Corona Ridge, Quill Peak, Mount Cline, Lion, Lioness and the White Goat Peaks (L to R). 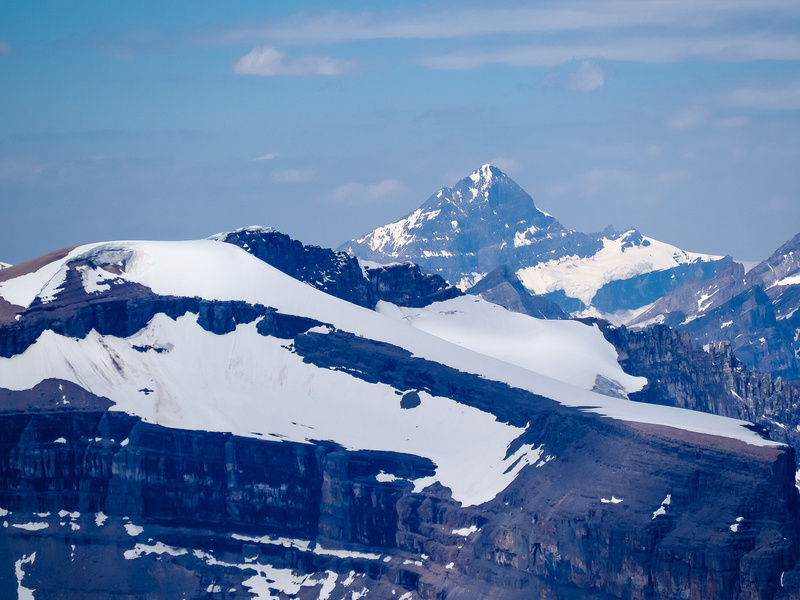 Mount Columbia rises over Mount Weed in the foreground, Chephren at left. From L to R, Christian, Walter, Ernest, Edward and Rudolph (i.e. the Lyells), White Pyramid and Chephren. 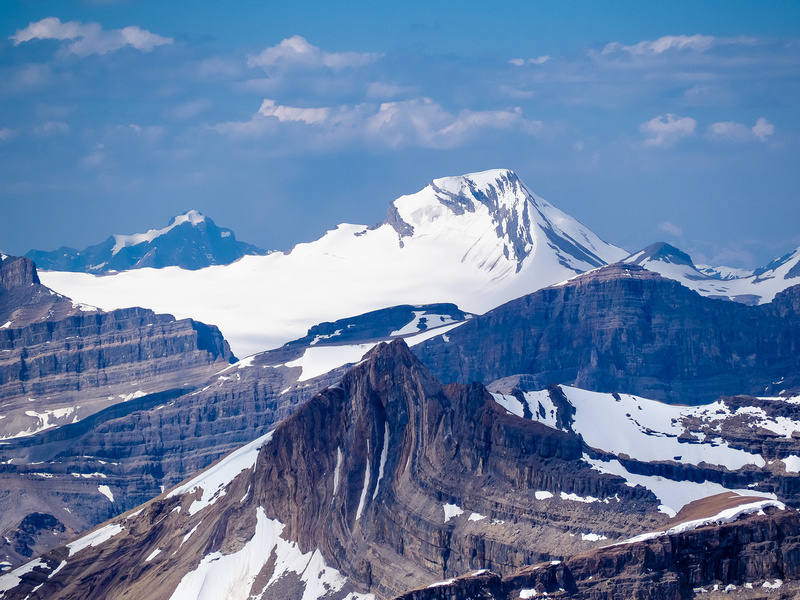 Mount Balfour is the highest peak on the Wapta at over 10,700 feet high. I climbed it back in 2010. Looking over the Dolomite Creek approach to Lake Katherine at top and Helen Ridge just beyond. 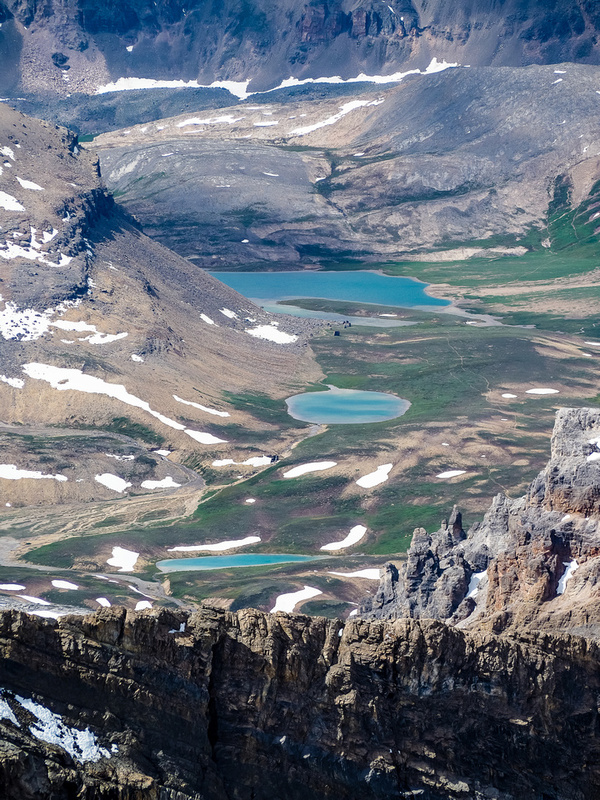 Pocket glaciers off of Cirque Peak fill this tarn before flowing over impressive walls of rock down to Dolomite Creek and eventually into Isabella Lake. I have very fond memories of my trip into the Devon Lakes area in 2013 with Eric, Ben and Steven. 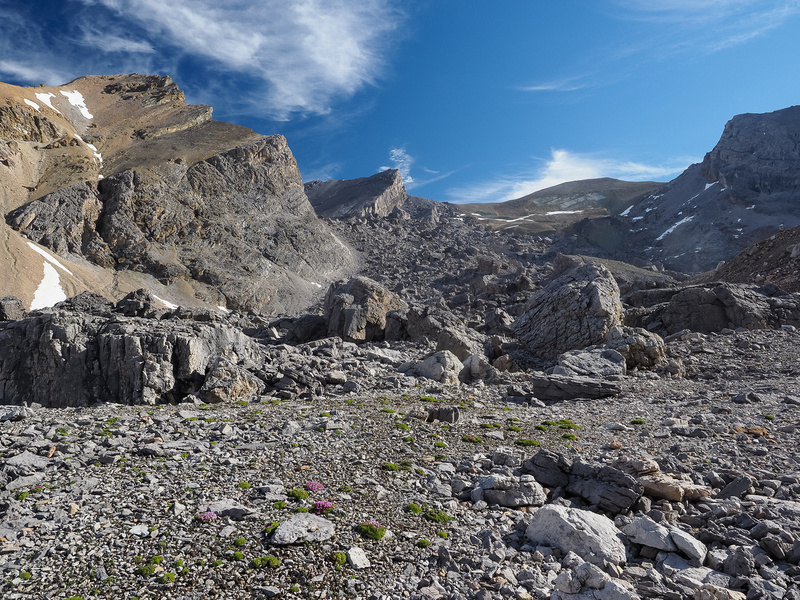 Sure - Recondite is an 11,000' pile of collapsing scree but what a gorgeous pile of scree it is! 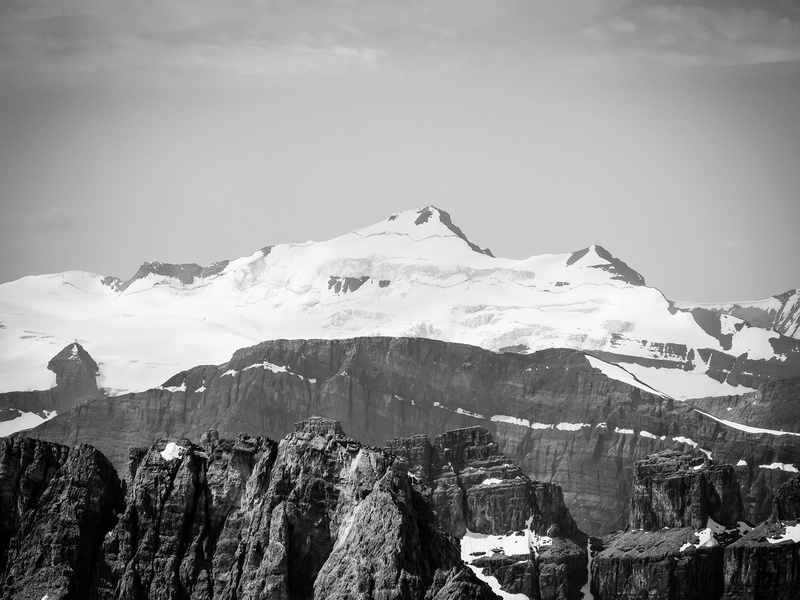 Cataract Peak is a near-11,000er located to the south - and also in a lovely, remote area of the Siffleur Wilderness. Find Phil in this shot as we descend the summit of Watermelon. Lake Alice at lower right. Phil descends break through the gap to the col on the ridge. Phil re-ascends the ridge from the summit col. There is a surprising amount of exposure off the east face of the ridge on Watermelon Peak. 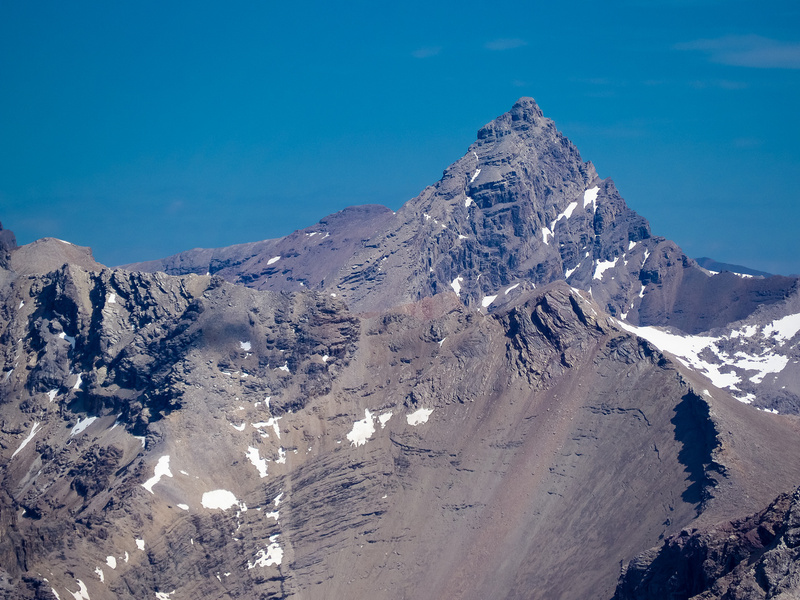 Molar Mountain is always distinctive - no matter which direction you photograph it from. It's also one of my top ten scrambles and will likely stay on that list for many years to come. Enjoying the airiness of the ridge. Down easy scree towards the even-better snow. The snow was just soft enough to descend quick and safe without being so soft that it was dangerous or annoying. Bobac looms over the boulder field as we continue our descent of Watermelon. Hiking across the valley bottom towards Bobac. Watermelon Peak from the gravel flats at the north end of Lake Alice (photo taken on return with better lighting).